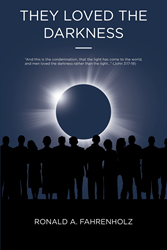 “They Loved The Darkness” from Christian Faith Publishing author Ronald A. Fahrenholz follows the stories of several different characters who live through the rapture. Based on prophecy and supported by Scripture, each story tells the tale of two characters, one who will be raptured and the other who will be left in darkness. “They Loved The Darkness” is the creation of published author, Ronald A. Fahrenholz. Ronald was born in Dayton, Ohio to a father who was an officer of the law and mother who worked in several restaurants. He is the oldest of four children. Ronald has been shaped by his faith in Jesus, a spiritual encounter with a deceased autistic boy, and three death-defying spiritual events. He has miraculously avoided an armed robbery by gang members, saved by chance during an attempted robbery and murder orchestrated by a career criminal, and survived a fatal multi-car crash. He also served in the US Army and worked as a security guard. Published by Christian Faith Publishing, Ronald A. Fahrenholz’s new book is a collection of short stories that reveals what it might be like to live through the rapture. The rapture is believed by many to either take place in the time before or after The Great Tribulation. Most theologians cannot agree on which while the word “rapture” does not even appear in most translations of the Bible. It is, however, an even that will separate the enlightened from the forsaken, the righteous from the wicket. Inspired by a dream and based on prophecy, “They Loved The Darkness” shares a collection of stories from the rapture. Each story will tell the tale of two characters, one who will be raptured and the other who will be left in darkness. For believers, “They Loved The Darkness” iterates the importance of faith. For unbelievers, these stories offer encouragement to who might feel compelled to surrender their lives to Christ. More information can be found at http://www.darkness.today. View a synopsis of “They Loved The Darkness” on YouTube. Consumers can purchase“They Loved The Darkness” at traditional brick & mortar bookstores, or online at Amazon.com, Apple iTunes store, or Barnes and Noble. For additional information or inquiries about “They Loved The Darkness”, contact the Christian Faith Publishing media department at 866-554-0919.